I finally got one of these Raspberry Pi mini computers to try out. This little board is a full computer with all the usual features, the best part is that it is only the size of a credit card, and uses just 700ma of current at 5V. 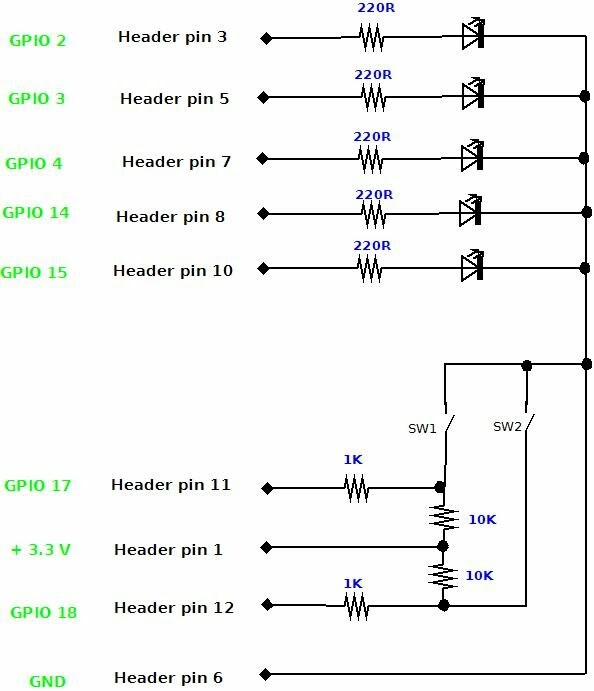 The board has 17 general purpose input output (GPIO) pins, that can be used to interface your board with the real world. This page shows how I built an LED sequencer to test out the idea. It has two buttons for input into the pi. many pins, so I just cut off the excess wire to avoid any confusion. The raspberry Pi is designed to work with a HD TV, if you don't have one of those, you can use a HDMI to VGA converter to convert the signal. Note that it must be a powered converter to work, the passive cables don't work with the Raspberry Pi. The Raspberry Pi GPIO outputs are not protected in anyway! I didn't use the two 1K resistors on my board (I forgot to add them). These protect the RPi if the GPIO pin is initiated as an output rather than input. The LED's are 3mm green LED's. I used python code to control the LED's. I've never used python before, however it seemed to be the easiest way to get this installed. You may need to download the Python GPIO library. This is apparently now bundled with the Rasbian, so you may not need to do this. Then: $su led.py to run the code. That's it!